Muffin, an 8-year-old female Rottie, presents with a two-week history of right front leg lameness. The physical exam is within normal limits except for a firm mass on the distal forearm, which is painful on palpation. You suspect a tumor. How would you approach this case? What are your rule-outs? Radiographs of the distal radius and ulna are the next logical step. They reveal a lytic and proliferative lesion with soft-tissue swelling (see photo A). 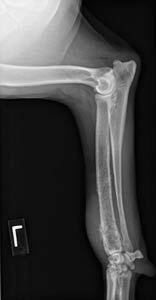 Malignant long bone tumors include osteosarcoma (about 85 percent of the time), chondrosarcoma (5 percent), fibrosarcoma (5 percent) and hemangiosarcoma (5 percent). There is a small chance of a metastatic lesion. If this were a benign lesion, it could be an osteoma, chondroma or bone cyst. It also could be osteomyelitis from a bacterial or fungal infection. Euthanasia offered as a sole treatment option is not ethically acceptable and medically recommended in 2010. Primary bone cancer is a treatable condition that requires a thorough work-up before irreversible decisions are made. Three views of the thorax, to detect visible metastasis (macro-metastasis). Fungal and bacterial cultures of the bone. The timing of bone biopsy is debatable. If the clinician is convinced that the lesion is consistent with osteosarcoma, or if the client has financial constraints, an open discussion should take place about the pros and cons of performing an amputation without the benefit of a prior biopsy. If amputation is elected, then a biopsy and cultures should be harvested afterward to confirm the suspicion. This is a huge leap of faith for the client, so it is important to document what was discussed and what the client chose. Should a biopsy be preferred first, then the surgery site is shaved, scrubbed and draped. A stab incision is performed in the skin. A hemostat or periosteal elevator is used to approach the bone. Several cores of bone are sampled with a Jamshidi needle (see photo B) or a Michelle trephine. It is prudent to use the smallest needle possible to decrease the chances of a pathological fracture of the bone. This is why most surgeons prefer Jamshidi needles. They are available from a variety of manufacturers. 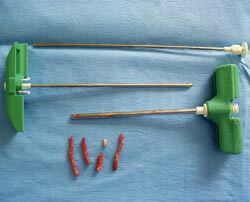 A 4-inch, 8 to 11 G needle is often used. The needle and its sharp stylet are placed on the bone and a small indentation is made. The stylet is removed, and cores of bone are harvested using a rotational motion in various directions. The first cortex and the entire medullary cavity are biopsied. If possible, it is wise not to go through the second cortex, as it will help maintain the strength of the bone. The biopsy sample is then broken off with a gentle rocking motion. To remove the bone, it is very important to realize that the tip of the needle is cone-shaped. At best, trying to push the core of bone through the “cutting” end will damage the sample. At worst, the bone may plug the needle and ruin the instrument. Therefore, the flat, cylindrical reamer is inserted in a retrograde fashion through the cutting end of the needle, and the bony sample is pushed through the entire needle. It is critical to harvest the biopsy samples from the center of the lesion, not its periphery (unlike soft tissue tumors). Several samples are submitted in formalin for histopathology, and one or two are placed in a culturette for bacterial (aerobic and anaerobic) and fungal cultures. The skin can be closed using a simple interrupted suture of absorbable material. A light bandage may be applied. The owner should be informed of a small risk of pathological fracture after the bone has been structurally weakened by the biopsies. Occasionally, it may be wise to splint the foreleg after a biopsy of the radius. Good communication is critical, as the owner will understandably be impatient and emotional. Decalcification and processing of the biopsies may require seven to 10 days before results are available. The same goes for the cultures. The accuracy rate of biopsies obtained with a Jamshidi needle is higher than 90 percent. Occasionally, the biopsy will reveal only “reactive bone,” which may be representative of reality, or it may mean that the wrong area of the bone was biopsied. For example, it is possible that the periphery of the lesion was biopsied, rather than its center. Again, honest communication with the owner is the best way to avoid a frustrating situation. It is wise to warn owners that this can happen, as infuriating as it may be. To decrease the risk of “missing the boat,” it may be wise to take radiographs after the biopsies are harvested. It is usually possible to visualize the biopsy tracts, and therefore confirm that the correct area was sampled. Once results are back, the client-vet team needs to decide which treatment route to follow if osteosarcoma is confirmed: pain management, amputation with or without chemotherapy, palliative radiation therapy, limb-sparing surgery, etc. Amputation is considered the gold standard in the treatment of osteosarcoma. The vast majority of patients function very well after front or hind limb amputation. Even giant breeds, overweight dogs and arthritic patients can recover well. With weight loss or joint disease management, they can do even better. If the patient is non-weightbearing on presentation, then it will not be difficult to convince the owner that the dog will be functional after amputation. If the patient is weightbearing, it may be useful to use a temporary sling to the affected leg. Amputation alone does not greatly improve survival compared to no treatment at all. So why do it? Because living with osteosarcoma is painful and can lead to a more painful pathological fracture. And because amputation provides excellent pain control. Despite the fact that most OSA patients function well after amputation, there are cases where limb-sparing is preferred or demanded by the client. Even though pulmonary metastasis (aka macro-metastasis) was not seen on thoracic radiographs, micro-metastasis is present in 90 percent of patients by the time of diagnosis. This is the reason chemotherapy should always be recommended as a complement of amputation. Whether the client accepts the suggestion is a different story. Our job is to provide the best treatment options. The most common drugs used for chemotherapy are cisplatin or carboplatin, but several other protocols exist. Radiation therapy can be used as a palliative treatment, as it decreases pain. Two to four fractions are given with few complications, but the benefits don’t last more than a few months. Regardless of the treatment chosen, pain management is paramount. A combination of an NSAID and an opioid is usually a good start, and other modalities can be added as needed. Biphosphonates, such as zoledronic acid, are believed to offer anti-tumor, anti-resorptive and anti-metastasis activity. 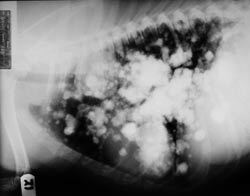 Invariably, whatever the treatment is, the cancer will metastasize to the lungs (see photo C). The patient will start coughing, the overall health status will decline, the appetite will decrease. It is the beginning of the end. Despite many preconceived notions, osteosarcoma is a manageable condition in 2010. Of course it’s not a good disease, but in the vast majority of cases we can provide comfort and quality of life to the patient. This article first appeared in the June 2010 issue of Veterinary Practice News. Click here to become a subscriber. Phil Zeltzman is a mobile small-animal surgeon in Allentown, Pa. His website is DrPhilZeltzman.com.